Mayonnaise Spread: Mix ingredients; cover. Refrigerate at least 1 hour to allow flavors to blend. Breaded Pork Cutlets: Pound meat slices to flatten to 1/4-inch thickness. Dip in eggs, then coat with combined cracker crumbs, parsley, salt and black pepper. Heat oil in large skillet on medium-high heat. Add meat, in batches; cook 2 to 3 min. on each side or until cooked through and golden brown on both sides. Drain on paper towels; cover to keep warm. For each serving: Spread 3 Tbsp. of the Mayonnaise Spread evenly onto 2 of the toast slices. 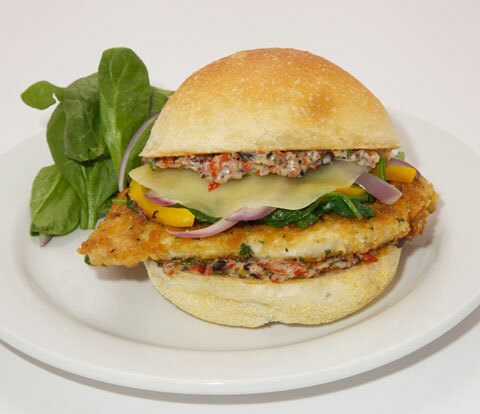 Place 1 Breaded Pork Cutlet on 1 of the toast slices; cover with 1/4 cup spinach, 2 Tbsp. onions, 1 pepper strip and 1 cheese slice. Broil until cheese is melted. Cover with remaining toast slice, mayonnaise-side down. Substitute sliced Asiago cheese for the provolone cheese.